To order complete include carton 1 of 2 STQON3172151 and carton 2 of 2 STQON3172152—sold and shipped separately. Enclosed side storage compartments include a total of four adjustable shelves behind framed glass doors. Two adjustable shelves in open center section. Lighting valance plus wire grommet for cord management. Selected wood veneers and traditional old world craftsmanship combine to deliver sophisticated storage for the discerning executive. Triple-coat lacquer finish, polished between applications, creates unmatched depth and warmth. 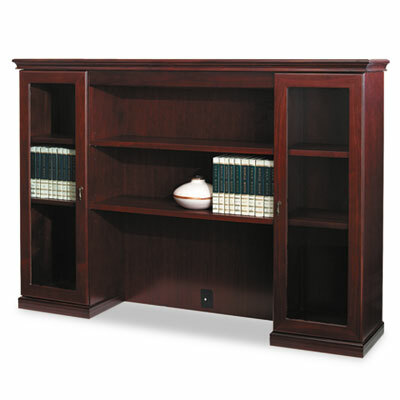 Enclosed side storage compartments include a total of four adjustable shelves behind framed glass doors. Two adjustable shelves in open center section. Lighting valance plus convenient wire grommet for cord management. To order complete include carton 1 of 2 STQON3172151 and carton 2 of 2 STQON3172152 — sold and shipped separately. Disclaimer Statement(s) To order complete include carton 1 of 2 STQON3172151 and carton 2 of 2 STQON3172152—sold and shipped separately.